Readers of Grange Notes will know that know that we’ve gotten the help of a very experienced HVAC technician, Bill Chidsey, who showed up at a Grange meeting at just the right time. He has proven a fount of good information and carefully considered ideas. He has now replaced the burner on the furnace , instead of us having to replace the entire furnace. He’s also installed a digital, programmable thermostat, which will warm up the building in the winter before a rental, and then turn down the heat afterward, instead of relying on our fallible memories. 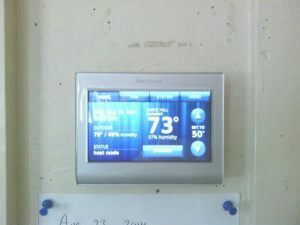 And we can even monitor the furnace and heat via the Wi-Fi connection! 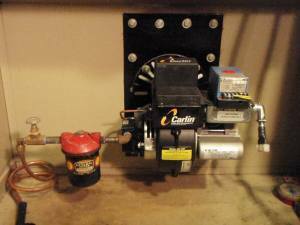 Total cost of the work was under $1,000, and should save us fuel-bills through improved burner efficiency, and better, more reliable controls. At a special Grange meeting on Aug. 2nd, we got a report from a new member of our Grange community, Bill Chidsey, on his investigations into our heating system. Bill has 40 years of experience in HVAC (heating/ventilating/air conditioning), with a specialization in increasing energy efficiency. He has surveyed the existing furnace and burner, the ductwork and heating distribution system, and the construction and insulation levels of our Grange Hall. We have lots of things to do to improve our heating efficiency, but we don’t have to start with a new furnace. Bill has a couple of immediate recommendations for making improvements: replace the burner (not the whole furnace) with a more modern, more efficient one (85 % compared to 76%), and install a programmable, digital thermostat. 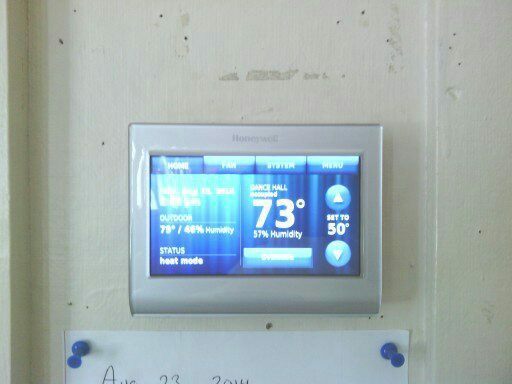 The new thermostat will automatically warm up the Hall before renters arrive, and turn it down when they leave. There will be provisions for short-term changes, but the basic schedule will be maintained–and the thermostat will never be left turned up. He expects that with these two improvements, we will save about a tank of oil every year–which is about $900 or $1000. Over the longer term, we need to keep making improvements. We have some obvious needs, like sealing the visible gaps around the entrance doors on the south end, the older entrance. We also have less obvious needs–like improving the heating ducts that bring the heat around the building, and return the cooled off air to the furnace to be heated. We can improve overall air-sealing, and improve insulation–especially around the poured-concrete foundation. All of these will improve the efficiency of the whole building, and will reduce the size of the furnace we need–when we finally are ready to do so. We are grateful that Bill has joined us in this effort, and have agreed to hire him to install the new burner and thermostat. He is confident that the furnace, with a new burner installed and correctly adjusted, will work for us while we make the other improvements. He started on Monday, Aug. 11th, and we’ll have a noticeably improved furnace and control system well before the heating season starts. Once again, the Grange thrives when people pitch in, and we all benefit. Great progress has been made on the trench and conduit needed to bring power from the building to the site of our new sign. A crew of volunteers joined me on Sunday, August 3rd to get started, and indefatigable Lewis Neill continued the work during last week. We’ve got 2 runs of conduit buried at least 18″ deep, from the corner of the building, across the driveway next to the building, and down the slope to the driveway from the road. Our crew on Sunday accomplished this much–many thanks to Alison and Andy Forrest, Stephen Wright and Kevin Taft! Then over the next couple of days, Lewis continued the trench and conduit across the lower driveway and began coming down the west side. We are still working on the design and planning for the new sign, but this work gives us a big step forward. And it’s affordable–I did get a quote from a dance community member with a Kubota tractor with a trenching bucket–but it would cost about $600 just to complete the run to the new sign location, money we don’t have. We’ll rely on “sweat equity” to get this project done–see my invitation in the adjoining column. The Friends have been awarded the grant! Getting closer to new bathrooms and basement exits! The Friends of the Capital City Grange Hall got some good news last Friday–the grant application which the FCCGH made to the Vermont Cultural Facilities Coalition has been granted! The proposal submitted will cover building new bathrooms downstairs, and will modify the fire exits so that the Fire Marshal will increase our legal capacity for people using the lower level. S0–when does the construction start? Well, first we have to raise the matching funds–the grant covers 50% of the cost, and must be matched with money raised by the Friends. This is a project which will cost about $50,000 overall, so it’s a big goal. And we won’t receive the grant money until the project is successfully completed, and the official report is accepted. The Friends have a good start on the matching funds, but more will certainly be needed. Your donation is tax-deductible, and will be greatly appreciated! You can find the donation forms at the Grange website: http://www.capitalcitygrange.org/node/345#attachments And watch for the new version of the Grange website, soon to arrive, which will allow direct donations with Paypal! What else do we need to get started? We need your help raising that money–will your employer make donations to community projects like this? Will they match your contribution? Contact Patty Giavara of the FCCGH (pattycope@comcast.net) to find out how! We’ll be needing some volunteer labor to do demolition, when we are ready to start construction, and also for painting the completed projects. Contact me to sign up to help during the construction! We need to fine-tune the plans before we start. We’ll be planning the schedule for the work so that we can minimize the time the bathrooms are out of commission–we are expecting to put a couple of Port-A-Potties in the parking lot to help out, and won’t want to do that in the middle of winter! Watch for the Friends’ fundraiser, which ends on Sept. 6th! Every year, the FCCGH and the Contra Dance Umbrella (CDU) hold a “challenge fundraiser”, which asks the dance and Grange community to match a “challenge” amount raised from a small number of loyal supporters. This year, the total to match will be $2,000, and the goal is a total of $4,000. Half of this will support the Grange’s operating expenses, and the other half will go to the renovation project. We’ll be collecting donations starting on August 16th, with the big push coming on Saturday, Sept. 6th, at a contra dance featuring Nils Fredland and the Free Raisins! And did we mention the dessert potluck? We’re celebrating the 100th anniversary of the Capital City Grange this year, so please be generous! It seems as if we have a great opportunity to “reboot” our Hall with this major project, we look forward to lots of contributions, as we all work together to update our community Hall.